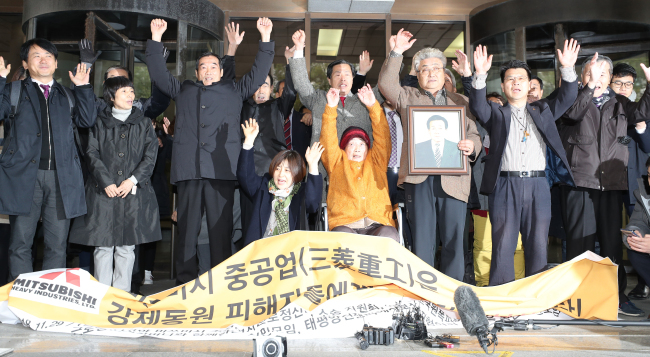 Supreme Court orders Mitsubishi to compensate Korean victims of wartime forced labor. South Korea’s Supreme Court confirmed two appellate court rulings on Thursday that ordered a Japanese company to compensate Koreans for forced labor during World War II. The four-judge bench handed down the decisions on two damages suits against Mitsubishi Heavy Industries Ltd. It upheld two rulings — one that ordered Mitsubishi to award 100-120 million won (US$89,000-109,000) each to four women, including 87-year-old Yang Geum-duk, and a victim’s family member, and the other that ordered the company to pay 80 million won each to six other forced labor victims. The rulings come about a month after the top court upheld a 2013 appellate ruling that ordered Nippon Steel & Sumitomo Metal Corp. to pay each Korean plaintiff 100 million won in compensation. The Oct. 30 ruling further soured the frayed ties between Seoul and Tokyo. The top court agreed with last month’s decision that the 1965 treaty signed between South Korea and Japan to settle colonial-era issues does not terminate individuals’ rights to claim damages. The female victims and family filed the damages suit in 2012 for working without pay at a Mitsubishi aircraft plant in Nagoya in 1944. They claim they were tricked by their school headmaster into believing that they would earn lots of money if they enlist in the Korean Women’s Volunteer Labor Corps. They had sued the Japanese company in Japan, but the highest court ruled in favor of Mitsubishi in 2008. They lodged a suit in Korea, winning the appeal in 2015 that ordered Mitsubishi to pay a total of 562 million won, around 100 million won each. The six other victims, including a 72-year-old surnamed Park, filed for damages against Mitsubishi for toiling without pay at Mitsubishi’s Hiroshima munitions and shipbuilding plant in 1944. Korea was under Japan’s brutal colonial rule from 1910-45. South Korea says Japanese leaders do not sincerely repent for the past wrongdoings and refuse to take full legal responsibility. Japan claims all reparation issues have been settled in the 1965 treaty that normalized their diplomatic ties. Kim Seong-ju, one of the volunteer labor group plaintiffs, cried as she spoke in the press conference held earlier by civic groups that advocate for wartime victims. “I have harbored this grudge for all my life, and I’m still living as if all my bones protrude. That’s the weight of my grudges,” the 90 year-old said.